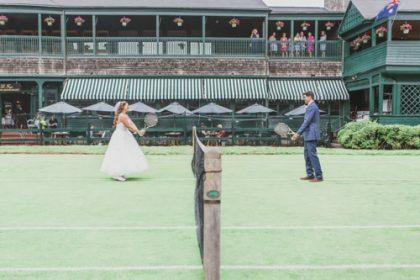 Before the ring, Emily and Scott had not only decided to marry, but already wanted the venue to be Newport’s International Tennis Hall of Fame. Their shared love of the sport, and their jobs in the world of tennis, made it a clear choice. The couple had ventured to Newport for a summer day trip to enjoy some tennis and to visit the historic property on Bellevue Avenue. While standing on the iconic Horseshoe Piazza, Scott surprised Emily with a precision drop shot, going on bended knee to propose right on the spot where their wedding would soon be held. 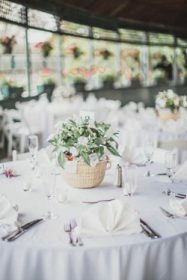 Tennis played a key role in the wedding theme, beyond the location. 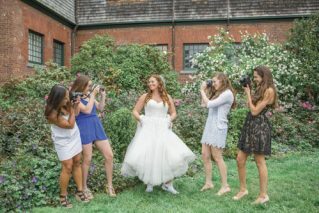 Tennis fashion was part of everyone’s attire, including the bride, who wore tennis sneakers with her gown. The DJ played the theme song from the 1993 Wimbledon Tournament as the couple jumped onto the famed manicured grass court, tennis rackets in hand. 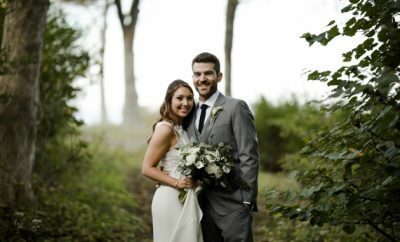 They volleyed back and forth as they were announced to their guests before meeting at the net for an emotional high five. The three-tiered, buttercream and carrot wedding cake was adorned with mini tennis balls and a topper of crossed tennis rackets, hand made by the groom. Guests found their seats using a tournament bracket style seating chart designed by the bride. 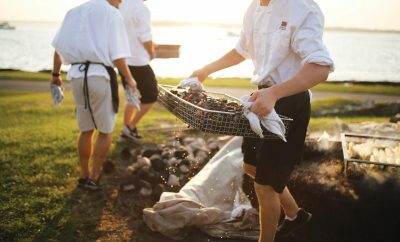 Rather than a traditional rehearsal dinner, the couple invited all 50 guests on a sailing tour of Newport Harbor. The sunset cruise aboard the Schooner Aquidneck left Bowen’s Wharf the evening before the wedding, giving Emily and Scott more time to visit with them. 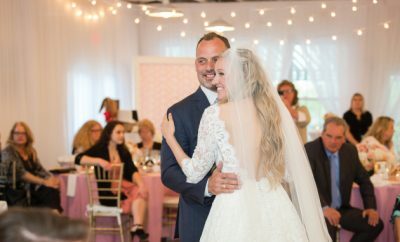 The bride and groom returned to work the day after their Sunday wedding, Emily as a professor and assistant swim coach at Bridgewater State University and International Tennis Hall of Fame educational program coordinator and Scott as a tennis professional. They welcomed a son, Michael Manion Reznich, into the family this spring.